ACT360 Media / TestDEN.com Blog: Where to get Powerpoint for free? Where to get Powerpoint for free? We get a lot of e-mail inquiries from students and teachers asking us where they can get Powerpoint for free. Well, it isn't possible because it is a Microsoft product but they do give education discounts and most school districts can buy in bulk. Presumably, if you are sending us your request, then it implies that you don't have access to a district license or that you don't want to spend the money just yet on the full MS Office 2003 suite. Of course, all of you are law-abiding citizens and have no desire to use pirate software. Use Microsoft's Powerpoint viewer to share your presentation with others who don't have Powerpoint. The viewer is free and you can get it here. However, if the point is to learn how to create presentations in Powerpoint, this viewer will not help you. Use the Impress presentation program in Open Office. 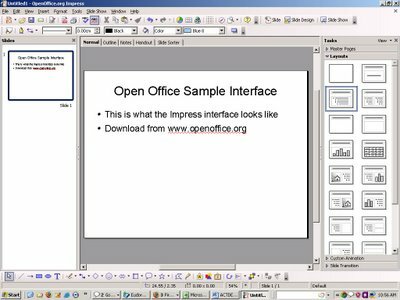 This is an open-source competitor to MS Office 2003 and it is free to download and use. I haven't tried it myself, but a quick glance at the interface shows that it has all the basic features of Powerpoint. I will test it out over the next few weeks with my own work and see how it goes. Download it here. Hmmm, maybe Jim and Sue should take a closer look at Impress? Impress can do all the same things as PowerPoint, so try that first. http://www.PowerpointsFree.com All PowerPoint templates are free for download and created originally, Most of PowerPoint templates have Chinese style.